Kevin Peterson is an analyst at Rice Dairy*, a brokerage firm in Chicago that specializes in dairy and markets at dairy’s periphery. He contributes this column exclusively for Cheese Market News®. Monday, March 12, marked the first session for the dry whey CME spot market. It took until Friday, and an offer of 29.25 cents per pound, until we finally saw our first trade. With the listing of dry whey, we now have spot markets for all five products (cheese blocks and barrels, butter, nonfat dry milk (NDM) and dry whey), reported on the weekly National Dairy Product Sales Report (NDPSR). The listing of this new market by the CME will finally give us price transparency for the dry whey market on a daily basis. Product that is eligible for trade at the auction will be U.S. Extra Grade dry whey between 41,000 and 45,000 pounds per car lot and less than 120 days old on the date of sale. The CME first launched spot markets for cheese, butter and NDM in January 2000. After a year of spot trade on the CME, cheese (both blocks and barrels) had over 1,100 loads trade, while butter had over 1,000 loads. NDM, on the other hand, was a different story, having not traded a single load in the first year. In fact, it would take about two-and-a-half years to see the first NDM spot trade at the CME. After that, trade continued to be slow to non-existent until around 2012. It took a lot of time and industry evolution for the NDM spot market to become an actively traded market. In general, it took time for buyers and sellers to get accustomed to trading off the dairy spot markets, but even more so for NDM. Even after the CME launched the spot NDM contract, almost the entire industry continued to price off of mechanisms such as the AOM (Average of the Mostly, released weekly by the USDA), CWAP (California Weighted Average Price, released weekly by the California Department of Food and Agriculture), and what was formally NASS but is now known as NDPSR (released weekly by the USDA’s Agricultural Marketing Service). Currently, a significant amount of trade is conducted off the prior CME weekly or monthly averages. An example of this would be a supplier telling an end user that they will supply their product in week 2 of a specific month with the price based off the average settlement price of the CME spot market in week 1 of that same month. This type of trade exhibits confidence in the pricing mechanisms of the CME and is prevalent in spot markets for cheese (both blocks and barrels), butter and NDM, and will need to develop for the newly listed dry whey contract. This can be expected in the future after the industry has had time to adapt and begins to see reliable price settlement from the daily spot session. It would be a reasonable expectation to see an increase in the volume of dry whey futures and options contracts over time. This will occur as a direct result of daily price transparency. 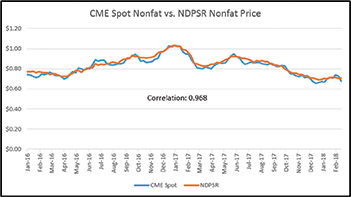 Looking at the corresponding chart (above), it should be noted that since 2016, the CME spot market has nearly a 97-percent correlation to reported NDPSR weekly survey prices for NDM. This makes CME futures and options contracts valid tools for hedging price risk. However, in the time frame from 2005 to 2006, the correlation was only 73 percent. This was back during a time that the NDM industry as a whole did not price off of the CME spot market. As dry whey now may be bought and sold off a weekly AOM number, hedging with a futures contract that will settle to NDPSR becomes riskier. The goal is to have the industry adapt to pricing contracts using the CME spot dry whey market as it has for other dairy products, making CME dry whey futures a trusted hedging tool. The views expressed by CMN’s guest columnists are their own opinions and do not necessarily reflect those of Cheese Market News®. *The risk of loss trading commodity futures and options can be substantial. Investors should carefully consider the inherent risks in light of their financial condition. The information contained herein has been obtained from sources believed to be reliable; however, no independent verification has been made. Information contained herein is strictly the opinion of its author and not necessarily of Rice Dairy and is intended to be a solicitation. Past performance is not indicative of future results.